I have a very opinionated little girl. Over the last years I have learned that with kids everything is a phase. Right now, my daughter is going through an intense phase of not wearing anything but dresses. Pink dresses I might add. I surrendered - getting her into separates is a fight not worth fighting. I love the Ayashe blouse and how quickly it goes together. How lovely would it be as a tunic or dress? Have you wondered the same? Here a little tutorial on how to lengthen the style. 1. Swedish Tracing Paper - I love that stuff and it literally revolutionized my sewing - I am not kidding. It doesn't tear like regular paper or tracing paper, will cling to the fabric, so there is no need to pin the pattern to the fabric AND it totally eliminates the need to carefully cut the pattern pieces prior to cutting into the fabric! Besides that it folds/stores well and can be ironed. A total time saver and therefore a win in my book! 2. Vary Form Rulers - a set of curved rulers that helps strike beautiful curves and is indispensable for paper pattern making. Easier on the budget though is this styling ruler that's kind of all-in-one if you are just starting out to make pattern adjustments. 3. C-Thru Ruler - a straight ruler that is a little easier to handle then a quilting ruler. Yet the later would work the same and if you go with the aforementioned styling ruler, you'll be set anyways. 6. The Ayashe pattern, of course. The pattern weights are optional and I only used them to accurately trace the blouse pattern from the pattern sheet. Now let's get to it: Lengthening the main body parts of the Ayashe blouse. Can you see my traced blouse pattern piece lying underneath my tracing paper? If you want to start out with the tunic length right away, make sure to start tracing you pattern towards the top edge of your tracing paper to leave enough space to lengthen the hem, at least 9" though. First, elongate the Center Front (CF - that's the straight line, not the curved one) in a straight line. 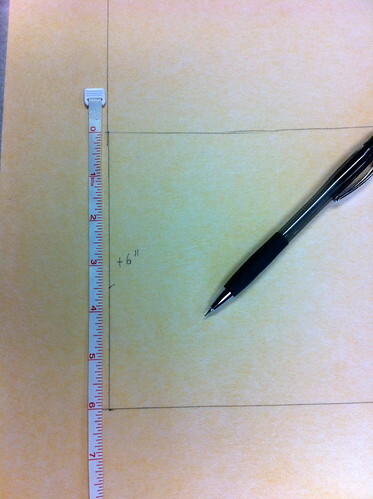 Measure 6" (for size 2/3 and 4/5) down along the extended CF line, and mark with with the pencil. Generally, if you want the outcome to be longer, add a bit more as it is so much easier to shorten, then to lengthen a garment. At the marking, draw a line in a right angle towards the side seam. It's important that this line is at a right angle - otherwise you'll end up with a funky point or dip in your garment. Now on to the side seam. With your Vari-form or Styling ruler, find a curve you feel will elongate the existing curve nicely. Cut the little corner like shown above to create a nice line. Don't worry too much, there is no single 'right' curve here. Yet, be careful as to let the curve swing out too much as it will be harder to hem a very dramatic shape at the end. Now, measure along the new side seam beginning with the original hem, the same length you measured along the CF and mark on that line. In my case, it's again 6". Then strike a short line in a right angle towards the CF and let it cross the straight hem line. Again, drawing a right angle at the side seam will ensure your side seams will sew together without a weird angle poking out or dipping in. Use your Vary-Form or French Curve and find a smooth curve connecting the new hem line with the right-angle-line we just drew. Your new hem line is almost finished! Final steps is to measure 1" and 3/4" up from the new hem line. Mark both. Lay your ruler parallel to the CF, intersecting the 1" mark - as shown above, and transfer the 3/4" mark down to the new hem line. Join this with the 1" marking. This little angle will help eliminate excess fabric when you hem the dress. Your new dress pattern is finished! Curious to see how mine turned out? Here's the final outcome of my pattern adjustment. A happy camper in a pink floral dress made out of Liberty Art fabric. Need any tips beyond the instruction booklet on how to put your dress together? Don't forget about Shelly's three part sew along Ayashe post here, here and here! Also did you see Jen's gorgeous hand embroidery for Valentine here? Now, we can't wait to see how your Ayashe turned out? Please share on our flickr group. On a side note: Do you love Liberty Fabrics as much as we do? We are preparing a little surprise give away on this blog - so come back again soon! Welcome to the last day of the Ayashe blouse sew along. It went too fast, that just shows us, that even with all of the wonderful details in this blouse, it is a simple pattern but still tastefully contemporary. Today we will set in the sleeves and finish the hem. I accidentally forgot to take photos of how I hemmed the sleeves. I got excited, and moved on to the next step. I am making the 18mo size and I found that turning the raw edge of the sleeve hem 1/8" twice was sufficient and left room for the sleeve to attach to the body. There is still room if you choose to turn the hem 1/4" twice, but I wanted extra room to set in the sleeves. I also hemmed the sleeves before I set them. 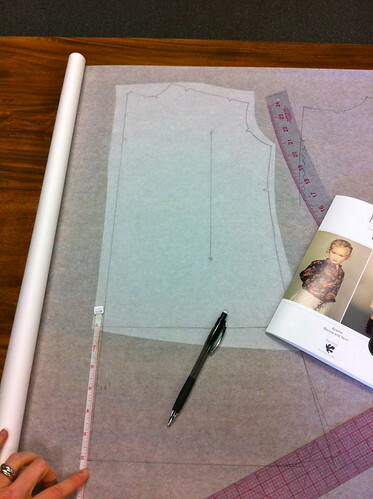 The reason why is because I find it easier to do this first rather than last for toddler size patterns. The reason why most don't instruct sewists to do this is if you look at the photos above you'll see that I hemmed and pressed my seam open, but it won't stay flat permanently. To fix this I tacked the seam allowance. It won't show and it fixes the issue. To set in the sleeve you will first turn the garment wrong side out. Insert the sleeves right side facing the right side of the blouse. Align the markings and underarm seam with the side seam and pin. You'll see that it fits perfectly, ahhh. The trick to setting a sleeve in little sizes is not trying to wrap the sleeve around the machine bar but place the presser foot into the sleeve itself. As you can see above I am sewing on the wrong side of the sleeve inside the sleeve cap. The machine will take me full circle without any drama. First, turn the bottom hem 1/4" and press. Turn again 1", press and pin. Leave a 1" opening to feed the elastic through the casing. I left my opening at the side seam where stitches will be less obvious. I am without a bodkin so I used a safety pin to thread the elastic through the casing. Make sure not to twist the elastic and don't let the tail get swallowed or you'll have to re thread. Overlap the ends of the elastic and stitch together. Sew the opening closed. How much elastic should you use? Good question. My neice's waist is 20" so I cut 15" of elastic that has a good amount of stretch. It stretched to 30". I would go by your child's waist measurement and deduct the amount necessary for the amount of elasticity the elastic has. On the wrong sides of the shirt hem fuse a 3" piece of interfacing to the blouse on the center bottom front hem. Sew buttonholes 1/4" to the left and right of the center front. Refer to day 2 on how to prepare the bias tape. Once you've press the tape in half, stitch down both edges. Knot the ends of the tape. Feed the tape/string into one buttonhole, around the hem line and out the other. Back Detail. My wooden hangers are curved which is causing the back to look a bit "hump back". I need to purchase some flat hangers. I don't know about you but I LOVE IT! I hope you find this sew along to be helpful as you sew your adorable blouse. Please come back again tomorrow because we have a very special guest hosting a tutorial on how to make the perfect Ayashe blouse just in time for Valentines Day! Welcome back to Day 2! It is nice and bright this morning in Portland and perfect for sew along photos. We left off yesterday with all of the pattern pieces cut, the upper collar interfaced and we gathered the front shoulders and back panel. I think we're ready, let's sew! For a larger view please click on the photo. Before sewing the center front seam it is best to measure the 1 1/4" seam allowance rather than hope for the best. This will ensure a nice straight line. Sew the center front seam from the bottom hem up. Once you reach the slit marking do a back stitch and then adjust the stitch lenth to the longest length. Press the seam open and fold the raw edge 1/4" under on both sides of the seam. The Ezy-Hem helper is a great way to measure this long seam so it will be nice and even. Press flat once more. Top stitch along both folded edges. Top stitch again centered between the seam alowance and the stitch line. Now you may notice I am not perfectly centered between the two. Why? Honestly? I was being lazy. I decided that if I aligned the presser foot with the center line it would give me a nice straight line all the way down. You should measure between the two lines, chalk and topstitch. Align the markings, distribute the gathers evenly and pin. Sew the seam. Remove the gathers. I like to press the seam up on the wrong side and then press again on the right side for a nice clean pressed look. Repeat with the front shoulder panels. The shoulder panels are now sewn, pressed and ready for the facing. Using a seam gauge fold the seam allowances 1/2" towards the wrong side and press. As you may already know I have an obsession with "Wondertape". Karen and I used to buy it by the box. I use it for so many things. In this case, I'm using it to hold the shoulder panel facing in place on the wrong side when I top stitch on the right side. If you don't know what "Wondertape" is (for some reason whenever I say the word I want to shout it out like Oprah when she would shout out the name of her guest.) then I'll quickly tell you. It is wash away double sided tape. Place the tape on top of the seam allowance, then place the shoulder panel facing on top of the seam allowance. Other options are to baste the panel in place or use pins. On the right side of the garment top stitch in the seam (stitch in the ditch) or next to the seam. I aligned my 1/8" marker on the presser foot along the seam and top stitched. Remove any baste stitches if used. Begin by stay-stitching the neck opening. We have two collar options: Mandarin Collar or Tie String. I'm going to take you through both. Press the bottom raw edge of the outer collar (upper) 3/8" towards the wrong side. Align the raw edges of the inner and outer collar and stitch along the short and long edges. Trim the seam allowance to 1/4" and clip along the curve. This will help reduce bulk and give you a nice smooth finish. Align the collar raw edges with the neck opening and markings. Pin and stitch. Trim the seam allowance to 1/4". Turn the collar towards the wrong side of the garment and smooth the edges. I used a dull pencil to do this but you can use a turning tool or a knitting needle, just don't use anything pointy and sharp. Once again, I found another use for my "wondertape" (no they don't pay us to advertise, but they should). Included in each pattern you purchase is a lovely woven label. These labels will give the garment that professional touch and they can also serve as hooks to hang the garment (like the Nituna Jacket). I placed the tape along the seam and then placed the label on top. Sandwich the Figgy's label between the blouse and the collar and be sure the seam allowance is tucked inside. Pin and top stitch. Done, unless your hosting a sew along and you need to show the alternative collar option. A little seam ripping and then we'll be ready. Yesterday I shared a wonderful "how to" link for making bias tape and if you read it you'll notice in my photo I cheated a little today. For good reason though! I love selvedge on Japanese fabric. Some of them are really unique and I really wanted to use this for the tie string, so I did. Press the bias tape in 1/2. Fold both sides in toward the center crease and press. I also folded and pressed mine once more to ensure a nice clean crease. Turn the garment wrong side out, open the bias tape and align the right side of the bias tape raw edge and the wrong side of the blouse. Leave an equal amount of tie string hanging off each end of the neck slit. Pin and stitch. Use the same method as the mandarin collar mentioned above to attach the label. Fold the tape in half wrong sides together, press and top stitch from one end to the other. Tie each tie string end in a small decorative knot. The last thing I did was sew a little bar tack at the bottom of the neck slit. I did this for extra security. A backstitch should suffice but I wanted just a little more security for the times when Ofelia wants to pull her blouse on herself toddler style. Look, it's almost a shirt! It's beginning to rain now which is perfect timing because day two is complete. Well Done! See you tomorrow to finish our Ayashe blouse! ps. Did you happen to catch Daniela's comment yesterday? She's got something gorgeous to show us very soon and you will see she gave us a small piece of her design wisdom.